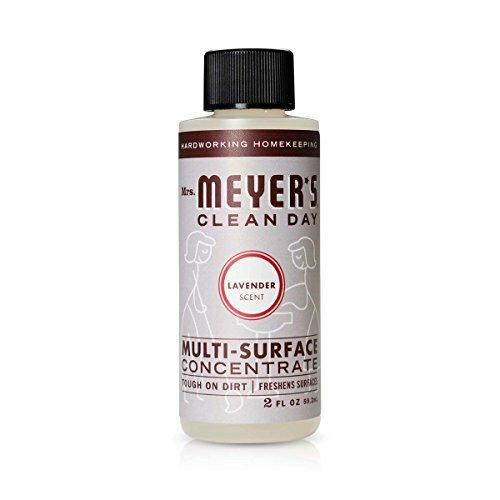 Mrs. Meyer's Clean Day Lavender Multi-Surface Concentrate is a hard-working generalist for use on all non-porous multi- surfaces. This garden-fresh lavender scented cleaner safely and effectively cleans floors, counters, and surfaces in bathrooms, kitchens or any room both inside and outside. Simply add one concentrate bottle and fill the rest with water. New mini concentrates save space, time, use less plastic and are easy to ship. Each shipment comes with product and scent labels to stick on the Living Mindful sprayer or your own spray bottle. Not tested on animals. Biodegradable.